The Derwent Coloursoft features a soft-velvety core and is available in a range of 72 colours. It is the UK's softest pencil and has a round 8mm diameter barrel and a wide 4mm velvety smooth colour strip. The pencil has the softest of cores and allows you to quickly add lots of bold, vibrant colour to your drawing. The softness makes these pencils excellent for mixing, blending and for creating large areas of colour. As they are excellent blenders, the 72 colour range is infinitely expandable as you are able to mix and blend colours to create new subtly diferent tones to suit your artwork! The Coloursoft pencil is amazingly versatile; the strip allows the laying down of vibrant and bold expressionist marks in contemporary sketches and drawings. Alternatively, the strip can be sharpened to a fine point to allow for more detailed work that may be required in fashion illustration, animal portraiture and landscapes. Derwent Coloursoft is a range of 72 superb colours, specially chosen for their richness and versatility. A panel of professional artists, who use soft textured pencils, have extensively tested the range and are very impressed with its performance. The pencils produce exceptional depth of colour on a wide range of drawing surfaces and interesting effects can be achieved using different types of paper. For rich, vibrant colour with easy blendability, Derwent Coloursoft is the perfect choice. The unique formulation means they can be mixed and blended to create an infinite spectrum of rich vibrant colour. Available individually, in tins of 12, 24, 36, 72 and a tin of 6 Skin Tones, as well as a wooden boxed set of 48 pencils. 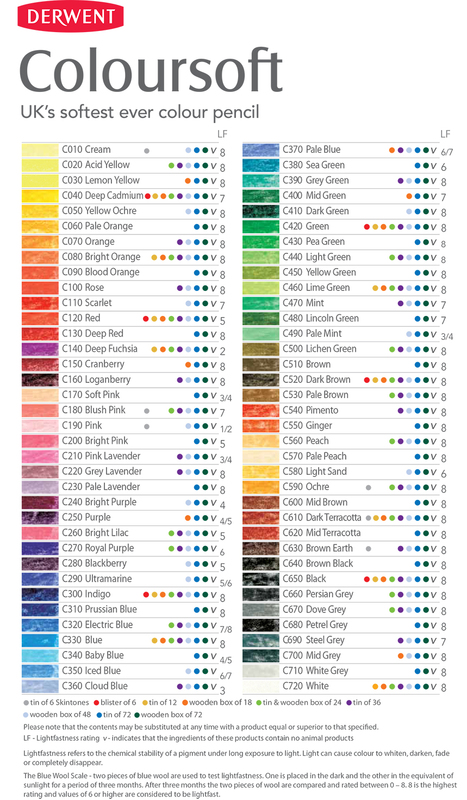 See below for a full colour chart! Try out every colour on the paper you are planning to use and keep it for future reference. Shade each colour from dark to light. Coloursoft is soft and waxy so perfect for blending. Practise blending the colours together. Alternate the order of layers e.g. red over yellow, yellow over red. Write beside your blended colours exactly what you did. You may not remember! Try blending brown and indigo to make a soft warm black. Use black for the pupil of an eye or the very darkest marks. Use the blender pencil to soften and even out layers and use a burnisher pencil to add a shine or photo-like finish to your drawings. Experiment with Coloursoft over a watercolour or Inktense wash. A great depth of colour and subtle shading can be achieved. Remember temperature can affect your pencils. A warmer environment can help your pencils blend more easily, ideal when completing larger areas. This video features a clip of professional artist Fiona Peart using Coloursoft pencils to draw a rose. During the clip Fiona shows various techniques including, using black paper, shading and highlighting. You can also download a project sheet where Fiona will guide you through creating a lovely evening landscape.